In 1940, construction began on the East Glacier Auto Camp located 6 miles (9.6 KM) along Going-to-the-Sun Road west of Hwy 89. Built on a stretch of land called Two Dog Flats, which is not all that flat, East Glacier Auto Camp took residence near the middle of the north shore of St. Mary Lake close to the confluence of Rose Creek, named after Charles Rose Yellow Fish. The East Glacier Auto Camp opened in 1941 offering 19 cabins and a coffee shop/camp store. During the Second World War years 1943 to 1945, the East Glacier Auto Camp was the only Glacier National Park facility which remained open for business. In 1950, Glacier Park Lodge in East Glacier petitioned Parks to reduce traveler confusion by granting them exclusive use of the name East Glacier. The East Glacier Auto Camp was renamed to become the Rising Sun Motor Inn. 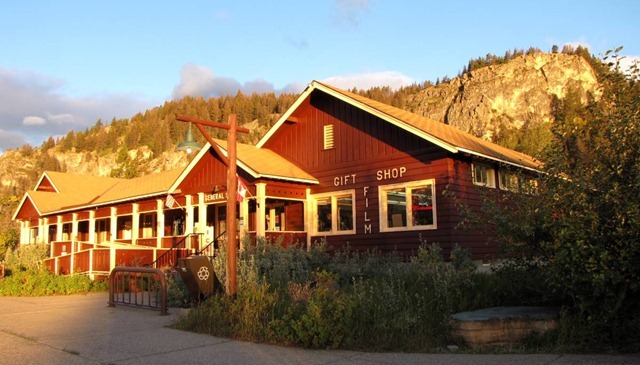 The present restaurant, lobby, gift shop, office and kitchen were built in 1956 and the original coffee shop beside the camp store was converted to additional motel units. Present day capacity is 72 rustic rooms in cabins and motel units. Accommodation inside Glacier National Park is relatively expensive but the major advantage is proximity to spectacular hikes, reduced travelling time and amazing ambiance. Most outside-park accommodation is southwest of West Glacier in the area of Columbia Falls, Kalispell and Whitefish, Montana, USA. Today the plan is to drive and return on Going-to-the-Sun Road, between Rising Sun and Lake McDonald Lodge with a bit of light hiking along the way. After Glacier National Park was established in 1910, the Great Northern Railway attracted travelers nationwide to their Midvale and Belton stops, respectively the current East Glacier and West Glacier locations. Initially, travel within the park was on foot, by horse or by buckboard shuttles to Lake McDonald or St. Mary Lake. In early days, steamboats would ferry passengers to lakeside camps. Ferry passengers complained that below deck it was insufferably hot next to the boilers, and topside, sparks burned holes in their clothes. In 1911, the automobile made its unwelcome debut in the same year William Logan was inducted as Glacier National Park’s first Superintendent. Almost immediately he set his sights on the creation of a road which would link east and west sides of the park. His vision resulted in the eventual creation of Going-to-the-Sun Road. The paved road is 52 miles (83 KM) long. The 12½ mile (20 KM) west side section and the 10½ mile (17 KM) east access are relatively civilized sections of scenic highway built by the railroad. The 29 mile (46 KM) stretch in the middle is an engineering marvel, literally blasted from the sides of steep mountains. Construction of the highway began in July of 1925. Logan Pass was chosen as the route over the Continental Divide and designated as Mile 0. Miraculously, only three men tragically lost their lives until the road was officially and ceremoniously opened on July 15, 1933. The road was not paved until 1958. Each spring, usually in April, crews begin clearing snow from the road so the route across Glacier National Park can open in June. It is not uncommon for the east side of Logan Pass to be plugged with 60 to 80 foot deep snow drifts which makes it challenging to find the road, let alone clear it. Driving the road is a unique and exciting experience. On this visit, the road is being maintained and rejuvenated in the third year of an eight year project. The road is closed Monday through Thursday from 9 PM to 7 AM for dedicated maintenance. The traffic on the road is light in early morning. Efficiently managed delays provide an opportunity to extricate oneself from the car to take pictures of views that would otherwise be impossible. There are many viewpoints from pullouts along the stretch of highway but many portions are very narrow with tight twists and turns. Cliffs on one side and low rock-wall barriers on the other require careful, knuckle-clenching caution. Speeding is not, nor should be, an option. Several tunnels burrow through mountains. The Weeping Wall splashes water on the car. Up close and personal waterfalls are spectacular and numerous along the route. Safe travel is a thin line between staying safe and enjoying the vistas. At many turnouts along the way, when the vehicle is stopped at a viewpoint for pictures, it is normal to breathe a sigh of relief for surviving the previous section. Following photographs feature views along Going-to-the-Sun Road, Heaven’s Peak, baby ducks on McDonald Creek, Lake McDonald and the shoreline Lodge. At Lake McDonald Lodge, lunch is enjoyed at the upscale Fireside Dining Room. While in the west area, there is an opportunity to hike the short and easy Johns Lake Loop and Trail of the Cedars. Scenic views on the return trip include the Logan Pass Visitor Center, Jackson Glacier and Wild Goose Island on St. Mary Lake. Jammers at the entrance to Lake McDonald Lodge in west Glacier National Park. Wild Goose Island on St. Mary Lake in late afternoon - one of the most photographed places on Earth.